There isn’t a day that passes where childhood memories don’t flash back to us during therapy because we are using the games that we loved way back when! Our favourite games from back then are now our favourite therapy games. Guess Who lends itself to many areas of language development such as generating questions, comprehension, deductive reasoning and describing salient features. Build a Beetle is fantastic for turn taking and addressing flexibility in gameplay. Do you want to make a beetle one colour or multicoloured? This is often the biggest challenge for our rigid kids – particularly if not discussed! Build a Beetle is also great for articulation targets ‘l’ and ‘l’ blends – “legs”, “blue”, “leaf”, “yellow”. Fishing rods, a pond or sea and magnetic fish can help achieve so many therapy goals – and not just speech goals as it requires a lot of fine motor and hand eye coordination! Turn taking is an excellent place to begin, then language development targets such as irregular past tense (“caught” or “got”) and basic concepts (colour, shape, size). If your child is working on ‘k’ or ‘g’ it is also great for articulation goals eg. “I caught a fish!” “I didn’t catch a fish!” “I got a fish! 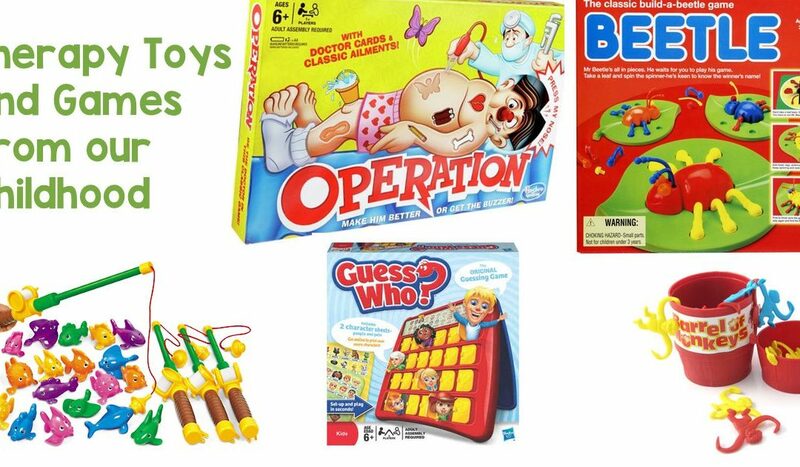 The buzzing excitement of Operation makes for a great therapy tool or reinforcer. Have your little one practice their target a few times and reward them with a turn. Fine motor skills are incidentally targeted during the game by using a pincer grip to hold the tweezers. Pincer grips are essential for developing dexterity and strength in the hands. Twist open the barrel and unleash the fun! A Barrel of Monkeys is perfect for working on medial ‘k’ or for reinforcing any articulation target by giving one monkey per 3-5 targets achieved. Language goals are endless with a Barrel of Monkeys: colours, sizes, following directions, creating and matching patterns and prepositions using the barrel. We hope this has given you some ideas for your Christmas Shopping list.